We follow certain syllabus in Music Department which consists both vocal and Instrumental. The children are trained in such a way so that they can choose Music as a career in future. We follow the syllabus which integrates both Modern and Cultural dance forms. Our children are well trained in both the faculty. We specialize our students in both Indoor and Outdoor games which include Football, Badminton, Basketball, Table Tennis, Kho- Kho etc. Chess & Carrom board. Nirvanian participate in Inter- School Tournament time to time. We have Martial Arts from Grade U.K.G. onwards so that the children can protect themselves from the changing and upcoming problems. It’s a personality building process which inculcates Om utterance, Voicing exercises, Speech exercise, facial exercises, yoga, conceptual thinking, writing and presentation. We lay equal emphasis to English Nepali in Dramatics presentation. Evaluation in Dramatics is done on regular basis. The sole motive of the incorporation of Dramatics as a subject is to make the students have a creative mind set. Art & Craft: Play Group, Kindergarten and Grade I to V have this subject in their course of study. Colouring, pasting, drawing, paper craft, clay modeling and activities of the same a kind is carried on. The higher grades go for advanced level. News Reading: We have formed a NIRVANA NEWS Room which has News Producers and News Readers. These personals are selected from our students. Daily News Reading is done in our School Assembly at two separate levels – Grade II to IV & Grade V to X. The News Reading section operates under the Supervision of our Academic Co-ordinator designated for the work. News is read simultaneously in English and Nepali. The News Producers & Readers are deployed on rotation basis for a fortnightly from Literary Club. Current happening in the country & around the world is focused in News Reading. Activities related to enhancement of students’ personality are done on regular basis and their talent is showcased through different events like; Spelling Contest, Game Show, Singing and Dancing Competition, Story Telling, Debate, Quiz, Talk Show, Drama Competition, Talent Show, etc. These events are held as Inter – House Competitions which encourage the students to work in groups. These events are staged according to the scheduling done in our year planner. 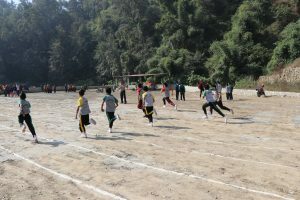 Students are encouraged to participate in Inter-School competitions also. Students of all levels are motivated to encash this opportunity. All classes from P.G onwards are taken for Field Trip to locations matching with their curriculum (English, Nepali, Science & Social Studies). Places of historical & archeological, horticulture, industrial significance are chosen for this purpose. Zoo, Museum, Palace, Markets etc is some favourite ones. Students belonging to Grade VI onwards are taken for Long Trip at reasonable expense. Such trip termed as Educational Tours/ Excursions are undertaken exclusively under the supervision of a Good Tour Operator. The clubs are run solely by students from Grade VI to X. under the supervision of Vice Principal and Academic Coordinator. The managing committee has President, Vice President, Co-ordinator. Treasurer who manage the club affairs. It also has a General Membership quota. All the posts/ designations are filled by students from Grade VI to X. The students who cater interest in those fields are selected for the club. The activities done are competitions, stage performance, Drama etc.